overyourhead: Yes 50th Anniversary #YES50 : Thank you so much for letting us hear your wonderous stories @yesofficial @asiageoff @QEDGManagement @PRConnect @BillySherwood @SteveHoweOne Alan and Jay. 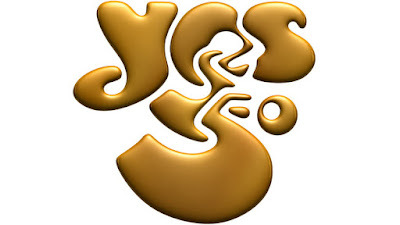 Yes 50th Anniversary #YES50 : Thank you so much for letting us hear your wonderous stories @yesofficial @asiageoff @QEDGManagement @PRConnect @BillySherwood @SteveHoweOne Alan and Jay. Last Saturday night Paul treated me to dinner and a night out to see musical legends Yes were performing one of the final two dates on their 50th Anniversary tour at the London Palladium in London's glitzy West End. The place was packed with men and women 'of a certain age' to watch and hear the prog-rock torchbearers perform seminal tracks from the band’s legendary back catalogue. The current incarnation of Yes is Steve Howe, Alan White, Geoff Downes, Jon Davison and Billy Sherwood. Making the show extra special, Yes played sides 1 and 4 and an excerpt from Side 3 of their 1973 album Tales from Topographic Oceans; their first record to top the UK album chart. As an added bonus for Buggles fans (like Paul and I) Trevor Horn made a guest appearance to sing Tempus Fugit from Drama. The gig also coincided with a 50th Anniversary fan convention so there were lots of ticket stubs, programmes and Roger Dean artwork on display too. Thank you so much for letting us hear your wonderous stories. Prog-tastic!